In 1901, Franklin Rolling Mill & Foundry Company was founded in Franklin, PA. Right in the middle of Steel Country, Franklin Industries is less than two hours from Pittsburgh, where Andrew Carnegie’s steel empire ruled the steel industry in the early 20th century. We’re another two hours from Johnstown, PA, where the first steel rails for the railroad (our raw material) were made. Steel rails linked Chicago and New York together with high capacity rails creating America’s manufacturing powerhouse. Our families have made an honest living in quality manufacturing for generations and are proud to continue that great tradition. Rail steel was created to carry the load of 100-ton rail cars. It’s almost twice as strong as the steel that holds up our bridges and skyscrapers. 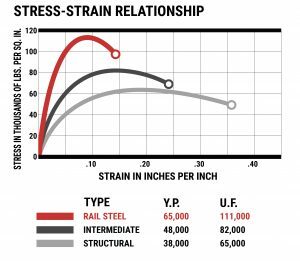 The strength of rail steel allows the design of lightweight structures that are still strong and durable. The furnace used to heat the rails is a Salem, Inc. walking beam furnace, which walks the rails through the furnace and can heat the steel up to 2300°F. Then, the rail is rolled through a series of mill stands, which reduce the thickness of the bar while increasing its length. It’s finally discharged onto a cooling bed, where the bar cools to around 400 °F. It is then cut to length. 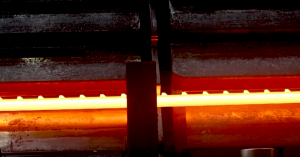 This process makes the steel even stronger than it was when it was on the railroad track.